I’m so glad I took your Blogging for Authors class because you’re right about how it makes us leaner, meaner, more disciplined writers. I’m actually enjoying it, even though it a lot of work, yet so rewarding. You’ve been right on point about everything. I loved The Art of Character class, too. It’s great to be part of WANATribe. Hope you feel better, Kristen! I bought ‘Rise Of The Machines’ last year. At the time I was busy all day every day with our boutique only dreaming of writing. Since January I am finally in my next adventure (boutique behind me) and I write, write and write. It’s way to early for me to think about a blog, well, I think about it, not ready to start one. My thoughts are always on what I would/will write about. About stuff that potential readers are interested in, that’s as far as I’ve come. I should probably grab ‘my domain’ while it’s still available. I’ve known authors to questions if they should blog, but in the end they decide to just stick with other forms of social media, such as Facebook. That’s their choice of course, but I stick with blogging for all those reasons that you mentioned (and it’s fun). 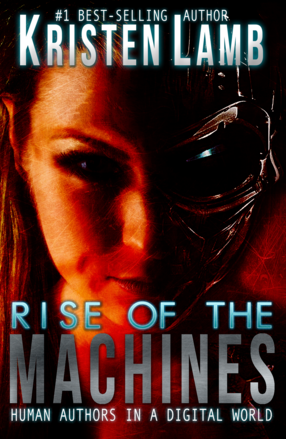 I’m glad I’ve read ‘Rise of the Machines’ and taken some of your social media/blogging courses. I’ve found them all to be extremely helpful and enjoy social media a lot more. Why is your bed wearing skirts? Victorian sensibilities? Secret life as furniture drag queen? Cunning concealment of trapdoor to Kristen’s underground lair? Concealing all the crap I shoved under there, LOL. I so hated that “be an expert” thing. When I questioned it, being the logical INTP, the Non-fiction writer would point at his advice and act like I was stupid. Even blogging on a subject you researched is not always good because it might not draw reader. At one point, I blogged on Microsoft Word for Writers. People treated me like I was help desk when they were too lazy to look it up. If I answered a question for them, they asked another one. My cowriter at the time had the same problem with his Civil War fire arm articles and people asking how much their guns were worth. None of them were ever going to get the book. I blog now on science type topics like how cool it is to eat pizza in zero gravity, military stuff (I’m a veteran), and writing topics (not how-tos). It’ll probably change again at some point, but I’m having fun. I’ve been involved with social media since 2004. The ONLY form which has remained unchanged aside from improvements (ability to add better images, video, plug-ins, SEO) has been the blog. Gather, MySpace, Squidoo, G+ and on and on have risen and fallen and something new taken its place. It is a moving target. Social media is SOCIAL and the only territory which cannot be invaded by spammers, automation, unchecked trolls, etc. is THE BLOG. It has been around since the inception of a digital world and will remain since it is merely WRITING which has been around for thousands of years. Thus, if I were to place my foundation on ANY bedrock, the blog is the only one that has thousands of years of success 😉 . Just started as symbols on pyramids….but still was sharing stories, information and pictures of CATS 😀 . With the mess with Facebook, I’ve been trying to figure out what I’m going to do. I want to remain where friends are but that may not work too long for the book series. I have a website that languishes because I’m always talking on Facebook about what is going on, with both a personal (which is pretty open) and an author page, I struggle to keep up with those. Twitter…uh, I often write more than 140 characters and so that makes me nuts. Here’s a topic for you: how do you look at the different platforms and choose which is best? Or do you go to all of them and, if so, how do you schedule that and still find time to write (and research). I use the blog as my hub then hang out the place I enjoy most. For now I enjoy FB. Twitter is all spam (book spam), though I check it daily. Platforms are best built the stablest place which is still the blog. Everything else we are a sitting duck. As far as time, other than the blog, I just hop on FB a handful of times a day. Maybe a half hour total over the day. Scroll down newsfeed and like, like, share, comment, post on my wall, back to work. One of, no, correction, THE best post I’ve read in, oh, forever.Thank you. I have a small presence on social media, but, like you, I mainly use my blog. Anyway, I find Goodreads difficult to use, Facebook, And Twitter non-productive and while interesting and sometimes helpful, LinkedIn seems to be mainly writer threads, not readers. I’ve seen this happen on sever other websites, if it gets bad enough people get banned for no reason, locked out, along with members stat fighting with each other more, more trolls come out of the worlds and start pushing the rift farther apart. I was having a conversation with a friend on Wattpad, trying to get her to see why it’s a bad idea to offer all of her books for free on there, and expecting people to go buy the full book on Amazon. I’m sure some will but I think most won’t bother as they are already getting it for free. After this first book of mine is done I’m going to post a few chapters of any others I make as a sample and send them to my blog. Your posting has definitely helped with this decision, thank you. I just hope my friend has backed up her books and sent them to herself by email, as you never know when a site will be down for months on end due to a server attack, bad weather, company going broke, stuff like that. Wattpad is making people (writers) ad mules. Free is never free and actually is very costly. I’d ditch that asap. She could have been offering free books other places that helped her SEO and drove sales though I am not a fan of free with no strategy. Friday Roundup – 4th May | Stevie Turner, Indie Author.